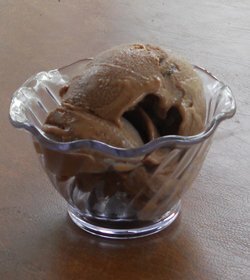 A goat milk ice cream recipe is a good way to make use of any extra goat milk you may have. Better yet, if you have lactose intolerance issues, goat milk ice cream is a great way to have your ice cream and eat it too. The difference between goat milk and cow milk is in the fat. The fat molecules in goat milk are smaller and much more easy for us humans to digest than cow's milk. Plus, goat's milk, unlike cow's milk, is naturally homogenized: the fat, or cream, doesn't separate from the milk like it will in raw cow's milk. Normally, that's a great thing. That natural homogenization one of the reasons goat's milk lasts longer than cow's milk. 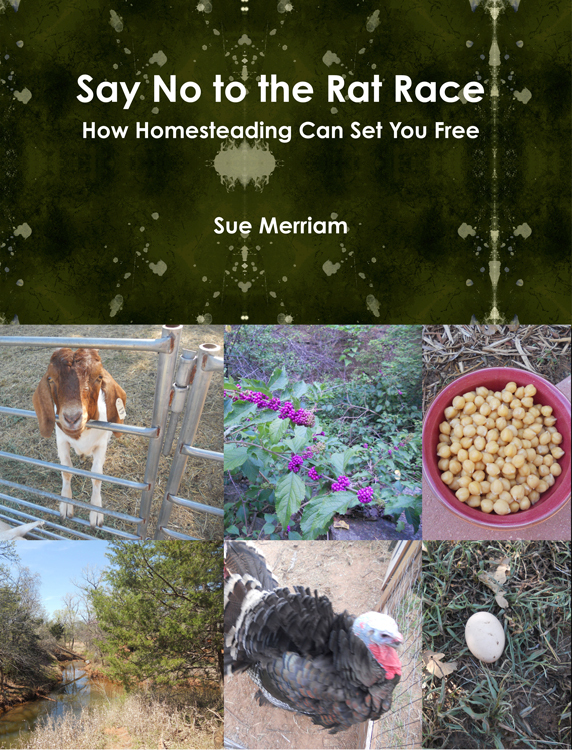 But it can be problematic when making goat milk ice cream. It's the cream that makes it creamy. This is the richest, creamiest, best-tasting ice cream I have ever eaten. Because of the difference of milk fat when it comes to goat milk vs cow milk you will need a substitute thickener to compensate for lower amount of cream in goat milk ice cream. That's why this recipe calls for egg yolks. The lecithin in egg yolks works as an emulsifier or stabilizer. It helps distribute the fat in the cream evenly throughout the milk and keeps it from separating. If you do have a lactose intolerance, you can make your ice cream with nothing but goat milk, but the consistency will be more like ice milk. Plan on eating it all right away; if you stick this in the freezer it will end up hard as a rock. If you want a softer, creamier version of ice cream, you will have to add cream to your goat milk ice cream recipe. If you want to make chocolate ice cream, you will also need 3/4 cup of chocolate chips. Put the goat milk, heavy cream if you are using it and 1/4 cup sugar into a heavy pan. If you are planning on making chocolate ice cream, also add the chocolate chips. 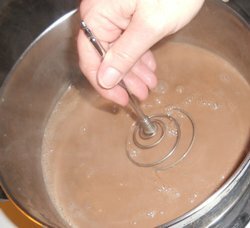 Bring the mixture to a simmer, continually stirring so that the chocolate melts and incorporates into the milk and cream. Remove the pan from the heat. Place the egg yolks in a medium-sized bowl and add the remaining 1/2 cup of sugar. Whisk together until they are thoroughly mixed. Then add one cup of the hot milk mixture and mix well. You want to do this so that the egg mixture heats gradually. If you add your eggs directly to the hot milk mixture in the pan, you'll get scrambled eggs. 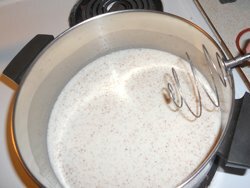 Whisk in another cup of the hot milk mixture. Then add the egg mixture in your pot with the remaining hot milk mixture. Stir well. Turn the heat back on to medium and cook the mixture, stirring continually until it begins to thicken. Add your vanilla and chill your mixture for several hours until it is good and cold. After it has chilled for several hours, place the mixture in your ice cream maker and make ice cream according to the ice cream maker's instructions. Give this delicious, creamy ice cream to your children, and they'll hound you until you promise to make more! 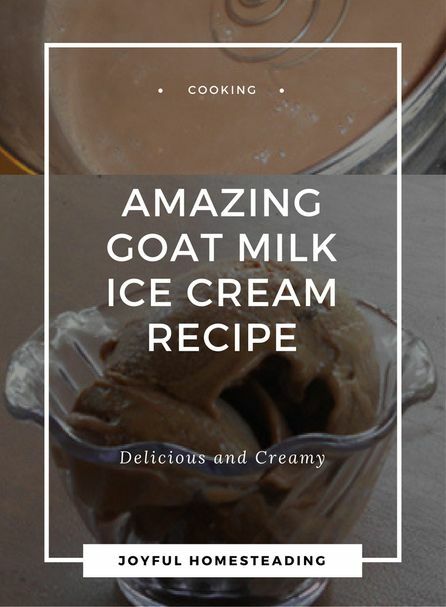 :-) This goat milk ice cream recipe makes one quart.